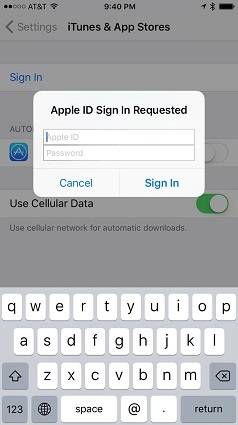 The terms iTunes Account and Apple ID are interchangeable: Your Apple ID is your iTunes Account, but you’ll need to be signed into iTunes with your Apple ID to download items from the iTunes Store. 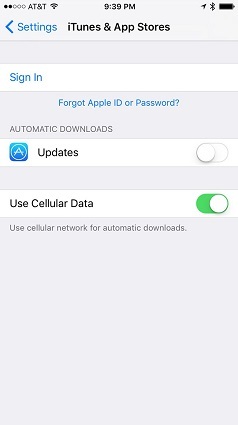 Tap Settings on your iPhone. Scroll down and tap iTunes & App Stores; the screen shown appears. Tap Sign In, and enter your Apple ID and password, then tap the Sign In button. 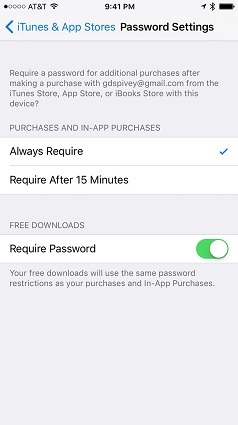 Tap Password Settings in the iTunes & App screen to bring up this screen. Select whether you’d like your password to be requested every time a download is attempted (recommended) or to allow downloads for up to 15 minutes after the password has been entered without having to reenter it. Also, toggle the switch to On or Off (depending on whether you require your password to be entered when downloading free items). It’s a good idea to set it to On; even if an app is free, there may be some items that you just don’t want loaded onto your iPhone without your permission. If you prefer not to leave your credit card info with Apple, one option is to buy an iTunes gift card and provide that as your payment information. You can replenish the card periodically through the Apple Store.